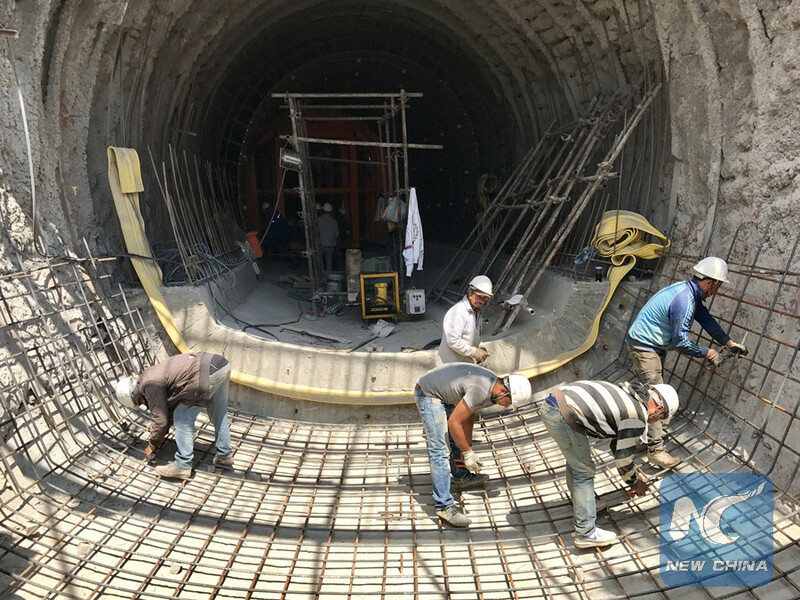 TUNIS, Aug. 13 (Xinhua) -- Wearing red and white safety helmets, around 20 Chinese and Tunisian mechanics were binding reinforcement bars on the floor at a dam project which is under construction. "I have worked in this dam construction for one year," said the 24-year-old Wael Torkhani, a local resident. "I not only learned skills from my Chinese colleagues, but also earned enough money to support my family." Passing through the mountains in El Kef province in northwestern Tunisia, the dam is built by Chinese power construction company Sinohydro, over the Mellegue River, which provides major water resources for over 240,000 inhabitants in the province. "The main function of the dam is irrigation and flood control," said Qiu Yusheng, the project manager. "The El Kef province always suffers from water shortage, causing slow development of agriculture, a major economic mainstay of this region." Sinohydro signed a contract with Tunisian government in 2016, according to which the dam will be completed in 2022 and become one of the largest dams in Tunisia. 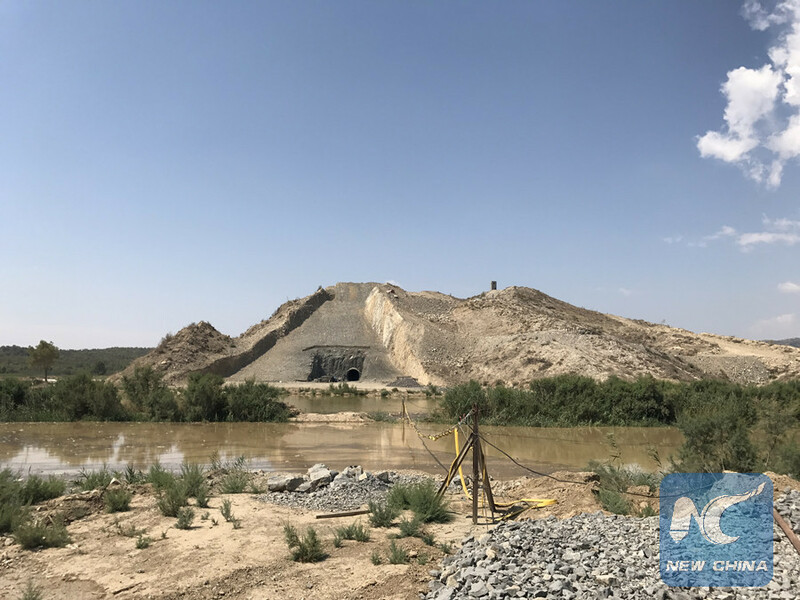 "This dam, with a total storage capacity of 190 million cubic meters of water, will protect the region from flood and meet the needs for irrigation and domestic use of water in the region," said Qiu. In recent years, Tunisians from underdeveloped inland areas, especially those from the west and south, are demanding for more jobs. According to latest data, Tunisian unemployment rate reached as high as 15.3 percent in the country, a total of 628,000 people. Torkhani told Xinhua that around 30 young men in his neighborhood worked at this dam. Before he was employed at the project, he used to work everywhere, barely making ends meet. The dam construction gave his life a leap. "Under the current disappointing economic situation, I think such projects help desperate Tunisian youth ensure daily livelihood," he said. Naji Touhami was a 54-year-old father of two and an experienced crane operator for 32 years. He joined Sinohydro one and a half years ago. "The salary here is good, above the average level in this region," said Touhami. "I almost have everything I need, enough to make my family happy. I'm very satisfied." According to Qiu, the dam project has recruited more than 130 local workers so far, and plans to recruit over 400 in the next few years. "During the construction, we also train local personnel. Six to seven Tunisian mechanics work with a Chinese technician, who patiently teaches them to master the necessary skills," said Qiu. For Cheng Faji, a 56-year-old Chinese technician, it was his third time participating in a project in Tunisia. He works with six Tunisian apprentices at the dam. "I used to work in Tunisia in 1993 and 2001," said Cheng. "at first, the communication was a big problem for me, gradually I learned the local language and now get along well with Tunisian workers, like friends." Touhami said Chinese colleagues helped him learn the key skills for better efficiency, "there is a lot for me to learn from Chinese, such as their punctuality, discipline as well as flexible management in human resources." Since 2011, the provinces in west Tunisia near the border with Algeria have become main stronghold of armed extremists. Qiu said even though the dam's location was near the borders with Algeria, they felt safe here. "There are two sentry posts nearby, and six armored vehicles patrolling around the camp and construction site 24 hours every day, responsible for our security," said Qiu. "We are grateful that Tunisian government attaches great importance to our safety." According to the Chinese Embassy in Tunisia, the Sino-Tunisian hydroelectric cooperation dates back to the 1970s. Since then, China has built a series of hydroelectric infrastructure projects including dams and irrigation systems to improve Tunisia agricultural production.